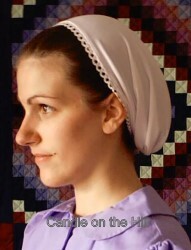 This cap/bonnet style covering is a customer favorite, loved for its comfortable, easy to wear, and unique design. Has cased elastic gather at the nape of the neck. 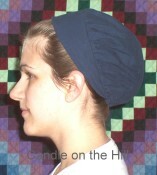 Ladies pattern includes choice of two lined brim styles: traditional or tapered/behind-ear brim and choice of regular or large crown size. Also includes child sizes! 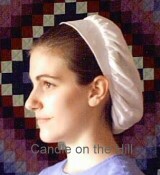 This covering is available custom-made from Christian Coverings.